The best motorcycle helmets will keep you comfortable while giving you reliable protection mile after mile. Your helmet is one of your most important pieces of riding gear when it comes to staying safe and alert. And if you suddenly have an accident and hit your head, your helmet immediately becomes your most vital piece riding gear. That's why, after you narrow down the best motorcycle helmets for you among the different styles and manufacturers, you must select the helmet that fits you right and will remain comfortable mile after mile. 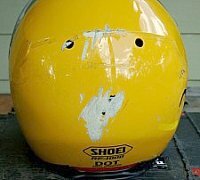 Regardless of the type of motorcycle helmet you're considering, before you actually try one on, first make sure it bears at least a DOT (Department of Transportation) certification decal. And for good measure, it could also bear a Snell (Snell Memorial Foundation) certification decal. 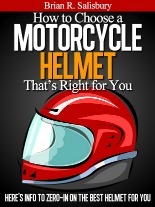 The best motorcycle helmets usually do. What do these certifications mean to you? The U.S. government's Department of Transportation (DOT) and the private, not-for-profit Snell Memorial Foundation (Snell) set motorcycle helmet safety standards in the United States. DOT establishes minimum standards all motorcycle helmets used on U.S. public streets must meet. Snell sets voluntary motorcycle helmet safety standards that are more stringent than DOT's. A helmet needn't meet Snell standards to be street legal. But if DOT and Snell put their stamp of approval on a helmet, the manufacturer has gone the extra yard to have its product meet the highest protection standards and is among the best motorcycle helmets. If your helmet comes with a high quality faceshield, the shield will have DOT certification info molded into it. A Snell-certified helmet must also have a Snell-certified faceshield. Please be aware, if you purchase a helmet not certified safe at least by DOT, you're buying limited protection -- or no protection at all. It is certainly not among the best motorcycle helmets on the market. Looking for a motorcycle helmet? Click here for a great place to find a helmet and other riding gear that's right for you. There's no universally recognized standard for head and helmet shapes. But a knowledgeable motorcycle helmet dealer will know how to help you when you say -- for example -- you're looking for a helmet to fit your oval head. 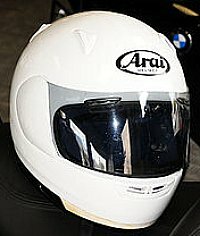 Determining the best motorcycle helmets for you is similar to buying a new suit. Even though you try on many suits of a particular size, you'll find one manufacturer whose garments fit you much better than the others. The same principle applies to trying on motorcycle helmets. You'll find that one manufacturer's helmets fit your head better and are more comfortable than the others. And even though you wear a particular manufacturer's size Medium in a particular model, it does not mean another model from the same company will fit you as well in that same size. The key to knowing if a helmet fits you properly is to make sure it is snug but not uncomfortable. 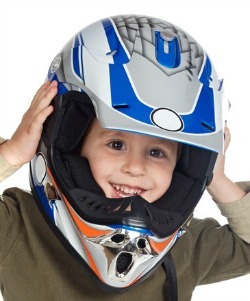 A loose helmet may come off in a crash and the wind swirling underneath will pull it up and strain your neck. A tight helmet will become an annoying distraction and give you headaches. A lighter-weight helmet will add less stress to your neck than a heavy-weight. New carbon fiber compounds have significantly lessened overall helmet weight. A helmet that fits well might be tight as you pull it on due to resistance from the foam padding inside. A helmet that pulls on too easily will not fit snug enough to stay put or block wind noise. When you try on a properly fitting helmet, its entire interior comfort liner will make contact with your head. If it only touches the top of your head, the helmet will become uncomfortable. A full-face helmet should grip your cheeks and jaw as well as well as the top and sides of your head. A nice feature on many full-face designs is removable cheek pads. 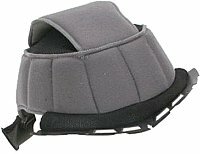 You can try different size pads to improve a helmet's fit. A helmet should surround your head with even pressure and without "hot spots" or pressure points. It shouldn't press uncomfortably against your temples, forehead or cheeks. A slightly snug helmet is better than one that's too loose because the padding inside will settle and compress a bit as it molds to your head. It's okay if a helmet seals in -- but does not pinch or bend -- your ears. This surrounding seal helps to block wind noise and protect your hearing while increasing your ability to hear important sounds. A helmet should remain stable when you shake your head vigorously up and down and side-to-side. Your skin and cheeks should move with the helmet when you try to twist it on your head. If your nose or chin touches the faceshield, the helmet is too small. 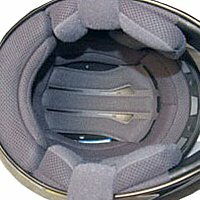 If you're looking at helmets equipped with a faceshield, the shield should seal all the way around the helmet opening. The faceshield should operate easily and remain in position when raised. The faceshield should not contain areas that distort your view. Such distortion can be quite annoying and will tire your eyes on long rides. Most helmets--including racing helmets--rely on the "D-ring" chin strap attachment system. This tried-and-true system will keep the helmet snug on your head when riding and if you have an accident. The system is easy to manage and infinitely adjustable regardless of how much clothing you're wearing around your neck. Various "quick-on-quick-off" attachment systems are out there, but none improve this basic method. Actually, most of the "enhanced" systems are a nuisance to use and really don't solve any problems. Usually you won't find them on the best motorcycle helmets. One convenient chin strap feature to look for is a button, clip or Velcro attachment that holds the length of strap left dangling after you secure your helmet. 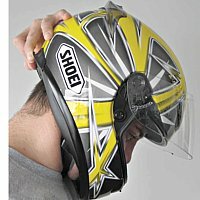 This little accessory prevents the tail end from flapping around in the wind and is a nice feature on the best motorcycle helmets. A helmet can't protect you if it doesn't stay on when you have an accident. So it's a good idea to do this simple helmet "roll-off" test before you buy or use a helmet. After putting on the helmet and snugging down the chin strap, grab the helmet's rear lip where it touches the back of your neck. Then try to lift up and roll the helmet forward off your head. Don't stop if your tugging becomes uncomfortable. If the helmet comes off -- which is most likely to happen with open-face models -- that's a sure indication you should continue searching for one that stays put. Your helmet ranks near the top when it comes to riding gear that can make any motorcycle trip -- short or long -- a comfortable, enjoyable experience or an unpleasant ordeal. After you know a helmet fits you properly, make sure it has the comfort features you need most. Some helmet ventilation systems will function much better than others to keep your head and face cool and your faceshield free of fog. Unfortunately, you won't know your helmet vent system's effectiveness until you start driving. But at least make sure you can easily open and close the helmet vents with gloves on. That's a key feature of the best motorcycle helmets. In addition to important comfort features, a helmet should provide various convenience features that make owning the helmet and riding your motorcycle more enjoyable. Try on numerous helmet brands and models to narrow down the best motorcycle helmets for you. When one brand seems most comfortable and suits your head shape the best, try other models with different interiors from that same manufacturer. Wear each potential finalist for a few minutes. If the helmet becomes uncomfortable -- such as pressing against your forehead or the top of your head or pinching an ear -- either try different sized cheek-pads or forget about that particular helmet entirely. Repeat the procedure with another "finalist" until you're completely satisfied. An enjoyable part of finding the best motorcycle helmets for you is selecting one that comes in a neat color or has stunning graphics decorating the shell. However, keep in mind how important it is for your safety to make yourself highly visible to other drivers. A light, bright helmet will really make you stand out. Actually, a bright colored helmet is probably one of the best attention-grabbers going for you when it comes to alerting other drivers of your presence. Also consider the steep premium you'll pay for even a basic graphic design on your helmet. And as the complexity of the design increases, so does the helmet's cost. As for myself, I bought a dark "anthracite grey" helmet to match my motorcycle's paint job. 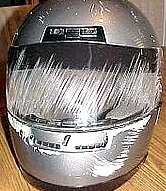 Then I plastered the helmet with numerous strips of white reflective tape to pump up its dull finish and make me more visible at night. I should have bought a white helmet in the first place. How much should you pay for a helmet? Many years ago, one of the major helmet manufacturers ran an ad saying, "If you have a $10 head you'll wear a $10 helmet." What dollar amount should go into that same advertisement today? Pick a number. Yes, you can get a comfortable DOT-approved motorcycle helmet for under $100. But it's an easy bet the best motorcycle helmets that fit you right, have the features you want and are most comfortable will cost lots more than less expensive models you've tried on. However, if you find a less expensive helmet that fits as well or better than a costlier model, and it is DOT approved, then don't hesitate to buy it. You'll be getting the same protection either way. The best motorcycle helmets are designed to protect your skull -- and your brain -- when the crushable foam lining under a helmet's hard exterior absorbs the shock of a single major blow. Once your helmet has done its job during a severe accident, you should definitely replace it. You can't trust it after it's been damaged. Learn all you can about motorcycle helmet designs, brands, models and features before you start shopping for one. Develop a general idea as to what design and features will suit you best. Don't be swayed by a manufacturer's perceived image, snappy helmet graphics or marketing hype. Before you buy your helmet of choice, wear it for 30 minutes or more to make sure it fits and feel just right. 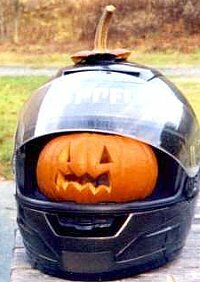 After you bring it home, wear that helmet every time you ride.